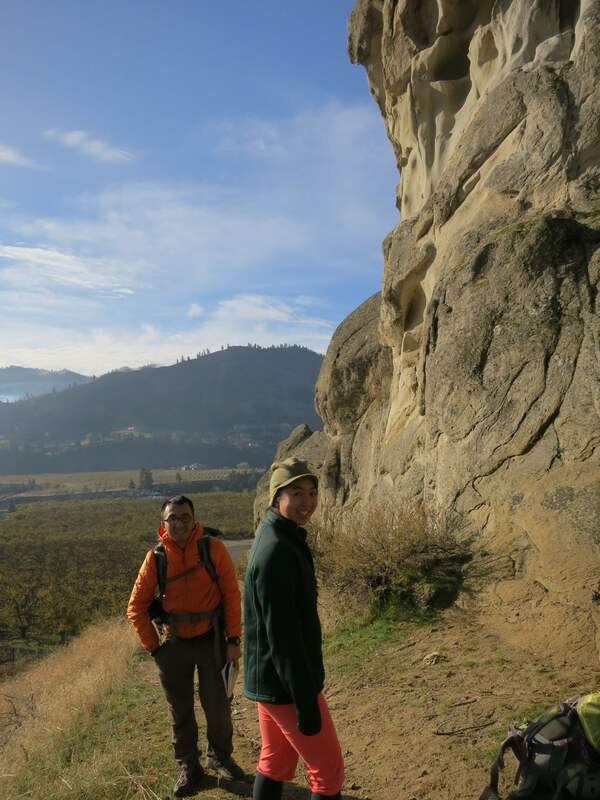 Gerry Chu & Jen Yu joined me on Saturday, Nov. 9th in an attempt to escape the gloomy gray drizzle that has taken over everything west of the Cascades. The Eastern Washington forecasts had been very promising when last week began, starting out with 50°F and 0% chance of rain, but those numbers kept creeping in the wrong directions until we were faced with a 40% chance of rain by the eve of our trip. We went for it anyway, leaving Seattle in the dark at 6:30am, driving towards the red horizon. 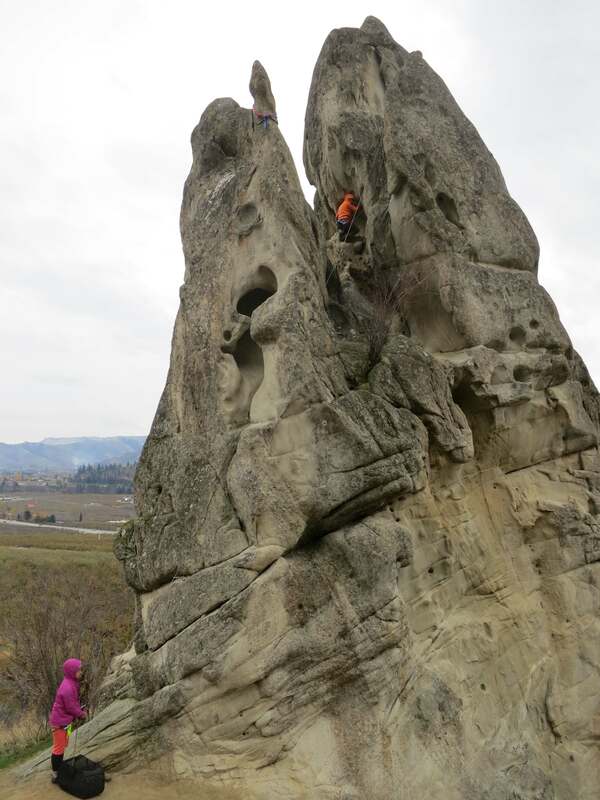 We picked up sandwiches to go at the Cle Elum Subway, and made final call there to go for Peshastin over Vantage, since the forecast was pretty similar, and the Pinnacles would be a new destination for both Gerry & Jen. Apparently you’re not supposed to climb on sandstone for 36 hours after it’s been rained on, and we had confirmed beforehand that it had not rained there since Thursday evening, putting us in the clear. We arrived around 10am to find blue skies (a welcome change!) but with wisps of clouds, and a very brisk start somewhere in the mid-30’s. Also, upon pulling up to Peshastin Pinnacles State Park, we were bummed to find the gate locked & displaying a very prominent “Closed for Winter” sign. Unwilling to be turned around so easily, I parked by the gate, put up my Discover Pass, and crossed my fingers. We walked in and around to the east side of Orchard Rock, and set up shop. 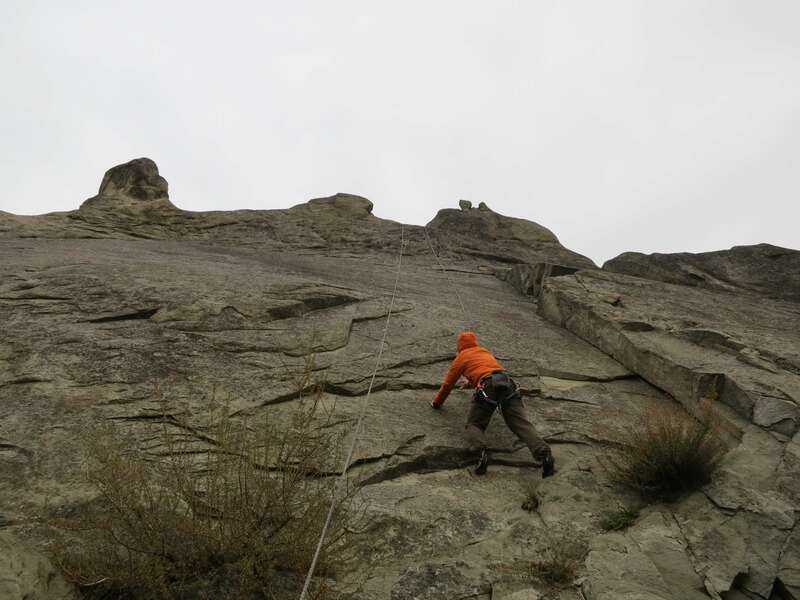 I wanted to start out on the route called “A Crack” (5.7, 2″ gear,) but once I was up there my ambition scaled back a bit, and I continued to the top via “The Gully” (the book says 5.-, but I’d call it at least an outdoor 5.5.) Coming from the back, I got to the high horn above “A Crack” and hung two single runners with a rap ring for later use (doubles would have been better, but singles were fine.) I beefed it up for top-roping by adding locker, and adding a taught downward anchor by stuffing a #0.75 into a crack at the base of the horn, and connecting it with a double runner. Gerry & Jen top-roped “The Gully,” and then we all top-roped “A Crack.” Concerned that we might opt the down-climb the whole route rather than rappel, we left a lot of the gear placements in while top-roping. The book suggests slinging a stalactite if you’re leading “A Crack,” but this makes no sense to me, wouldn’t a sling just fall off? The stalactite was a handy road-sign letting you know it’s time to step out of The Gully if you want to climb A Crack, though. The crack is worth a little protection on the back of your hands, I did a little damage to mine without it. I went last, and rapped off of my original anchor on the horn. 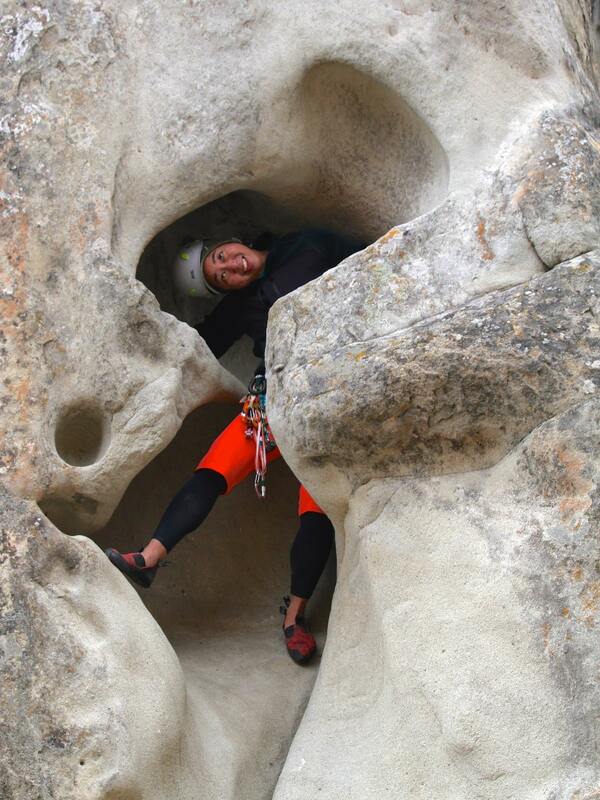 Moving counter-clockwise around Orchard Rock, we tackled “The Tunnel” (5.6, 2″ gear.) This bizarre and entertaining route means what it says, you actually climb through a tunnel, come out the other side, and then you have your pick of various high points to continue and finish the route. I think I chose the most difficult one, inspired by the line in the book heading for Orchard Rock’s summit rather than to the easy-looking horn above “The Tunnel’s” start. It requires a step around an arete with only one half-decent hand hold (feel around the corner, lower than your right shoulder) and a lot of faith in the friction of your feet, but it’s not that bad. Above that, I began to worry about what would be usable for a top anchor. A large flake pointing up had a single, scary loop of damaged webbing that was not so much behind the flake, but pinched between the rock at the top of the flake. I sunk a #8 nut and a #0.3 cam in a crack to the right of the flake, and went to work untying one of my double runners, threading it behind the flake and hooking it from the other side with my nut tool. I managed to do all of that while on the sharp end, but had Jen take and hold my weight when it came time to retie the water knot. Like before, I added a rap ring for later, and a locker for lowering & top-roping, leaving in the gear for the top-roping. Since there were two people top-roping it after me, I had to crawl back through the tunnel mid-lower, but that proved much easier than I had feared it might be. Jen went last, and had no problems rappelling off the side rather than having to go through the tunnel. We browsed the book looking for a moderate route that would open up more top-rope opportunities, and we set out to find “Porpoise” (5.6, 1″ gear) half way up up Martian Slab. 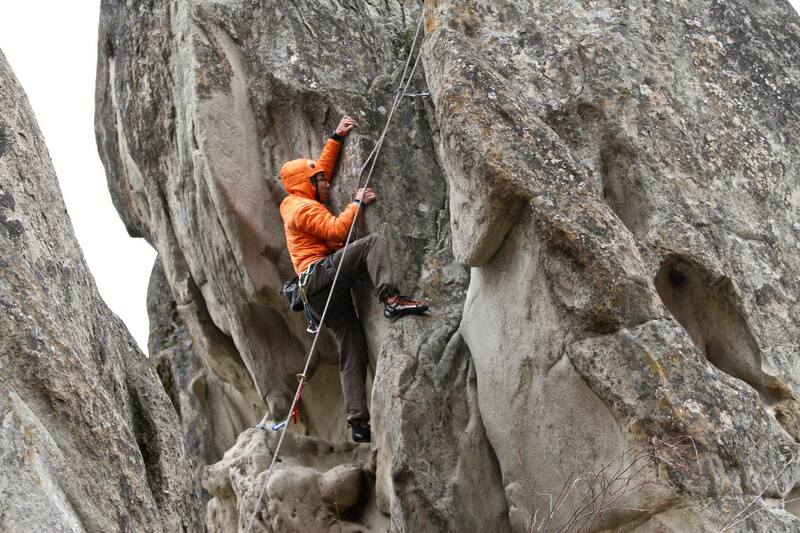 The book showed it as sharing a rappel anchor with a handful of other friction slab routes. I took off up the little dihederal, clipping a rusty piton as my first piece, then stepping out to the easier face on the right. 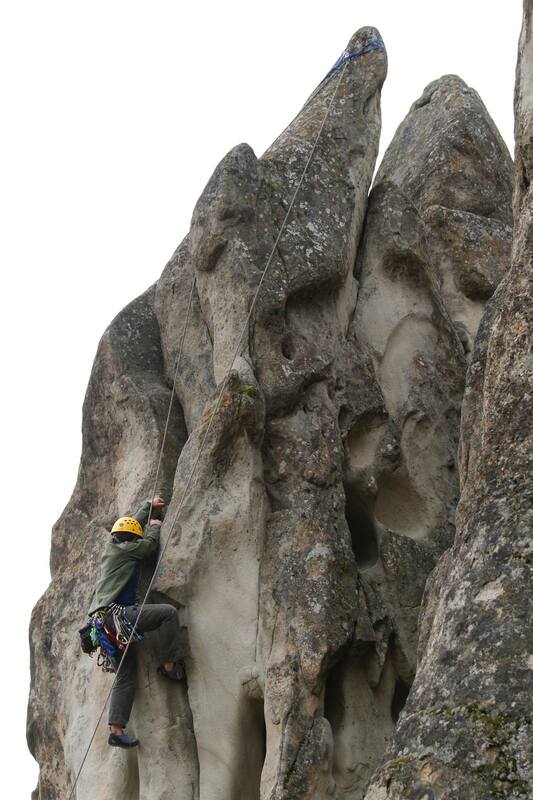 The climbing was moderate and fun, if you don’t mind friction moves. I eventually veered far left towards a shiny silver carabiner we could see hanging from a bolt, which we assumed would be the rappel anchor. I suppose it was someone’s rappel anchor, but it was just one bolt, and the carabiner was the non-climbing hardware store variety, so I wanted to look for something better. I kept going and going, up and rightward so I’d get back to the original vertical I had been on. The rope drag was awful, because I figured it “couldn’t hurt” to clip that “rappel” bolt. The rock got a little more crumbly than usual, but it was still doable if you were careful. Eventually, I topped out on the ridge and found a bunch of old slings on a feature. I added some 7mm cord, but I was out of rap rings and I didn’t notice any already on the slings. I extended that to make a top rope anchor, but wisely thought to ask Gerry if he had seen the middle mark go by while I was climbing. He said yes, it was about 20 feet above him. Oh goody. As he lowered me, I cleaned nearly all the pieces I had placed, especially that bolt far to the left. That bought us just enough rope length to stretch it to the ground, thankfully. Gerry & Jen top roped, and Jen kindly sacrificed a cheap carabiner with the gate taped shut in order to rappel. During Jen’s climb, we started feeling drops from the sky, which had completely clouded over as the day progressed. We packed up and headed out as soon as she was down. It was 3:30pm, and even if it hadn’t rained, we would have had to pack up before 5pm due to the early sunset. I feel very successful and satisfied about our day! We each got to climb 4 routes, and it was really interesting going to this less travelled area. No parking ticket to boot, though YMMV. Since it was too early for a dinner in Leavenworth, we stopped at a Korean restaurant once we were back in Seattle. Out of the rack I had brought, I only ended up using BD C4 cam sizes #0.3 through #1, with doubles of the #0.75 and the #1 proving quite handy. I also used tricams liberally, and nuts sparingly. I always bring a little webbing to leave behind, and a cheap rap ring or two, but next time I visit Peshastin I’ll definitely bring more of both. We only spotted one proper pair of rappel chains all day, and it wasn’t on route we climbed, so go with the expectation that you’ll need to create your own rappel stations.